US Republican presidential hopeful Herman Cain has admitted his interviews may have suggested that he was changing his account of allegations of sexual harassment in the 1990s. Mr Cain said the discrepancy was due to the fact that he had become "gradually able to recall" the events. On Sunday, Politico reported that two female employees complained of sexually suggestive behaviour from Mr Cain. But he insists the allegations will not affect his campaign. On Tuesday, speaking on HLN, sister channel of CNN, Mr Cain explained that he disclosed details of the incident throughout the day on Monday as he "was gradually able to recall" events that happened 12 years ago. Referring to a series of interviews with US media during which he gave new details about whether financial settlements had been reached with his former employees, Mr Cain conceded that "it looked like I changed my story". "If I could do it over... I would start with the last interview I did last night and make that the first interview of the day." In particular, Mr Cain clarified that he remembered a "separation agreement" was made, versus a "legal settlement". He told HLN what he remembered of the incident. "I made a gesture by putting my hand under my chin, standing near this lady, saying: 'Oh, you're the same height as my wife.' My wife is 5 feet tall, she comes up to my chin and I was simply making that comparison." "We were in my office, the door was wide open and my assistant was sitting right outside," he added. But Mr Cain maintains he knows nothing of a second alleged case of sexual harassment. He told HLN: "I absolutely believe this is an intended smear campaign," designed to stop his recent rise in opinion polls. Politico's original story on Sunday said that separation packages had been given to the women to leave the National Restaurant Association and not discuss the allegations. At an appearance at the National Press Club on Monday, Mr Cain said he was "not aware of any settlement". But later in the day, speaking on PBS, Mr Cain said he did know of an "agreement". The former head of Godfather's Pizza said the accusations will not interfere with his campaign timetable. "We're not going to allow these distractions to get us off message." His campaign told CNN that $300,000 (£188,000) in campaign funds were raised on Monday. 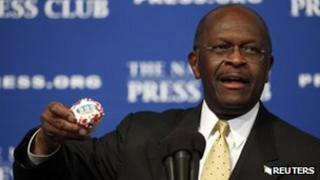 Can Herman Cain go the distance?